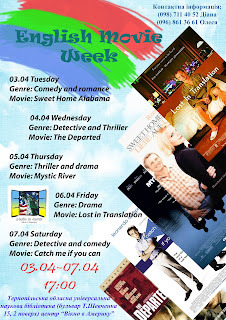 In Window on America center, Ternopil Scientific Library, from 3rd to 7th April there was the English movie week. This week was led by a PC volunteer Alonzo Hudkins, a student of Ternopil national economic university Diana Goliash and a leader of WOA center Olesia Goncharuk. There were 57 participants, among them students, specialists, librarians, journalists and volunteers. The people liked the English movies this week. Every day after watching, they discussed the movies and asked about unknown words. Many journalists were interested in this project.